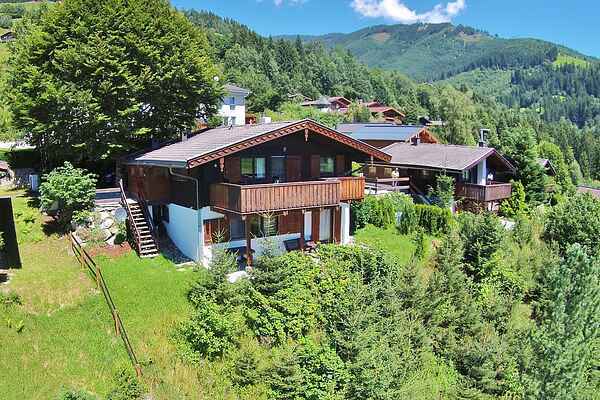 Just outside the little village of Niedernsill, in the heart of Salzburgerland province, high up in the village on the sunny side of the valley, you'll find this beautiful, wooden chalet. When you arrive, you'll immediately notice the stunning vistas and breathtaking natural beauty with the amazing peaks of the Hohe Tauern National Park. The chalet is spacious, full of character and has a practical layout. On the ground floor you'll find a pleasant living room with a wood-burning stove and direct access to the balcony, a separate, modern kitchen, a bedroom and a bathroom. In the basement, which is only a partial basement as the house was built on a slope, you'll find the remaining 2 bedrooms as well as the second bathroom. There's also a wonderful terrace here, offering some vast views. Skiing enthusiasts can make use of two skiing areas that are easy to get to at 12 km distance. During the high season, you could also consider the adjacent skiing area of Walchen, which makes a nice challenge for kids or beginning skiers. During the summer there are plenty of sports and hiking activities for you to do, and you can reach most of the sights of Salzburgerland very easily.